Age: 44 Dealer since: 1990 Dealerships: Pacfico Mazda, Pacifico Hyundai and Pacifico Ford, Philadelphia Average monthly Mazda sales: 40 new, 15 used Quote: "I think being up is a positive thing at this point. When you look at other franchises that we all kind of look up to, like Toyota, and you see that they're down, I think that any increase, especially coming off the last couple of years, is a positive." Last year was busy for Mazda. Mazda unveiled its new "kodo" design language, shuffled its U.S. executives and parted ways with Doner, its ad agency of 13 years, to hire WPP Group. The moves have Mazda poised for a potentially big year. It will launch its next-generation SkyActiv engine technology this summer. Team Mazda, the WPP Group team assembled to handle Mazda's marketing and advertising, is expected to unveil the brand's new creative direction as early as April. 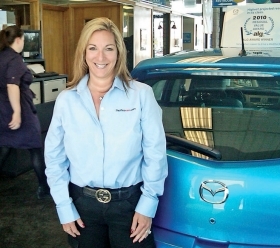 Staff Reporter Ryan Beene spoke with Maria Pacifico-Shore, chairman of the Mazda National Dealer Advisory Council and a Mazda dealer in Philadelphia, about the current state of Mazda and what's coming up for the brand in 2011. Q: How was 2010 for Mazda dealers? A: As a whole it was good. I think that we kept pace with the industry, and I was up a little bit more personally than Mazda was nationally. I think being up is a positive thing at this point. When you look at other franchises that we all kind of look up to, like Toyota, and you see that they're down, I think that any increase, especially coming off the last couple of years, is a positive. Why didn't Mazda see the big gains experienced by some other, smaller brands such as Volkswagen and Subaru? I think that production was calculated to be at a certain level. We also went through a lot of transition -- the advertising agency change probably being the greatest change. But I think that they're doing a great job. That's going to be huge for us. What will the big issue for Mazda dealers be in 2011? I think the biggest issue, from what I'm hearing, is the marketing and where we're going with it. Mazda has a lot of irons in the fire -- new powertrain technology, new design language, a new ad agency. How will those factors affect the brand in 2011? We're going to keep pace with the industry. We're going to have certain pockets that are going to be ahead of the game and certain pockets that are going to be flat, but overall we're going to grow with the market. I think there is still more building to be done. We're talking bout seeing 100 percent fresh creative in April, and we'll still have a good portion of the year to go. I think probably the only frustration has been just waiting to see creative. And when I say frustration, it's not really frustration. I think that everybody is excited and anticipating it. We always want the newest, biggest, best thing, and we don't want to wait for it. There's a lot of contact. They have a great presence in the field. [Mazda North American Operations CEO] Jim O'Sullivan is an amazing guy, and he really doesn't do anything without input from dealers. I've gotten calls from him at all hours of the day saying, "What do you think about this?" And that was before I was sitting where I'm sitting. So they reach out. There were many changes to Mazda's executive ranks this year, including Ron Stettner's appointment as vice president of sales. How's that working? It's great. He's a very smart guy. He understands the retail side of the market as well as the manufacturer side. When you speak to him, there is a great understanding of what dealers need in the marketplace. Marketing, incentives, customers. The normal bag of tricks. What are some of the hottest models in your region? CX-7 and CX-9 are doing great. Are dealers satisfied with Mazda? I think they are. I have friends that have a lot of franchises, and I don't know anybody that's unhappy with them right now. Right now, everybody that I know that's a dealer is pretty optimistic. Are Mazda dealers profitable? Do you expect to be profitable in 2011? Yes. I can't tell you off the top of my head what the percentage is, but I can say that it's a healthy percentage right now. I think as dealers we've learned to operate under different circumstances than what we were used to. I think we've made the necessary adjustments to make ourselves profitable. What are Mazda dealers doing to attract more service business? It's something that seems, not specifically for Mazda, but it seems that in the last two to three years it's been a struggle with every franchise. I think a lot of it is making sure our pricing is competitive with the non-OEMs. I think the focus is getting people into our service departments that have not been here for the last year. Does Mazda have any new programs in place to help with that? No, other than our Mazda Customer Direct program, but I would say that there's a renewed focus. It may not be a national thing; in my region there's a renewed focus. What are Mazda dealers doing to attract more F&I business? There's no directive right now from the manufacturer. That falls under what the dealers' responsibility is. Is it difficult to get Mazda customers financed? For the Mazda customer in my showroom, the ability to get financed has grown dramatically over the last four or five years. They're more professional, have better income and better jobs. Marketing is the key: to find a voice and get out into the market in a manner that we are going to be able to speak to the largest portion of our demographic or psychographic and tell them about Mazda and drive them into the showrooms. We have great product, and once you drive it, you want to own it. So, it's a matter of awareness. I don't really think that we are missing anything. We compete in every segment, and we're well-represented. We really kind of have it all. We're going to be the first Asian manufacturer to have a diesel. Is Mazda's advertising attracting your target buyer? Is anyone being left out? I don't think anybody is being left out, but there's always opportunity to talk to more people. And I think that within the next two months, there will be a very clear vision from Team Mazda about how they're going to speak to our customers. Have they given any hints about their strategy? Not really. They've talked about having a bigger digital presence, and that's pretty much it. I will tell you, though: They are some of the smartest and most creative people I've met. The fact that they have every aspect of their business under one roof is huge for us, and there is a very big comfort level among the dealers with Team Mazda. What was the reaction among Mazda dealers when the brand announced it had selected WPP Group as its ad agency? Was there any resistance to parting ways with Doner after 13 years? You're always going to have people that have allegiances, and we're also smart enough to know that we need to grow our business and that we need to go in a direction with a team like Team Mazda. Everybody has been very receptive to the change. It was long-standing relationship with Doner. Personally, I think [Doner President] Tim Blett is a wonderful guy. We're all human beings, so from that perspective, it's difficult. But we're all businesspeople, and we need to move forward. Mazda is a few years into its relationship with Chase, or Mazda Capital Services. How is that working out? It's working out well. They're willing to work with us. They have truly become a partner. I have a high penetration, and I have my floorplan with Mazda Capital Services, and they get a large portion of my Mazda business. Has the relationship helped to increase leasing? It's tough to say where the increase comes from. But when you look at ALG and you look at CX-9 having the No. 1 residual and the brand overall having the No. 3 highest residual for a brand, I think that has a lot to do with leasing. Team Mazda, Mazda's new creative agency, has been up and running for about four months. What has been the biggest difference so far that dealers have seen? The jury is still out on creative because everyone knows it's not the final product. But I think in terms of the process and communication, the dealers are happy. They've come out and talked to all the dealer advertising groups, and you get an idea of their commitment.